The ban on Medal of Honor in Army and Air Force Exchange Service stores doesn't sit well with a Marine Corps corporal who pointed out that the military has no problem selling "products that actually hurt people" like tobacco and alcohol. Corporal Aaron Hostutler of the United States Marine Corps sees a certain hypocrisy in the Army's decision to keep Medal of Honor out of its stores because it lets gamers play as Taliban fighters - sorry, "Opposing Force" - trying to kill American soldiers. "In Call of Duty: Modern Warfare 2, you can play as several different countries' forces and often you're playing against and killing Marines or our allies," he told the Stars and Stripes. "I don't understand how Medal of Honor is any different." 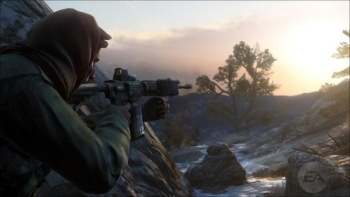 There are plenty of other violent games available through the AAFES, including Modern Warfare 2 and Grand Theft Auto 4, and movies like Brothers, in which a captured U.S. soldier is forced at gunpoint by Islamic extremists to beat a fellow soldier to death with a pipe. Hostutler said the ban was probably put in place by "a commander who doesn't play videogames and hasn't caught up with the times yet." Stocking the game isn't the same as endorsing it, he added, and people who find it offensive because they've been "personally affected" by the war should simply not play it. He also pointed out that while the AAFES won't carry the game, it has no problem selling other products that have actually been proven to be harmful. "They sell alcohol and tobacco too, substances that actually hurt people when they choose to use it," Hostutler said. "But it is their choice."